Caverns Measureless to Man is the story of the passion of an extraordinary individual who spent his life exploring underwater caves. For nearly 30 years, Sheck Exley was the leader of the explorers. He set the records, he developed the techniques, and he maintained the highest standards of excellence. Sheck lived a life of adventure, danger and excitement of a degree that few people can even dream of, or, if they do, those dreams are nightmares. But just what does the word "explorer" mean. Bill Pogue was the Command Pilot for the Skylab 4 mission, a test pilot and spent a tour as an US Air Force Thunderbird pilot. He once said, "Basically, I believe that since the turn of the century (1900) the (American) population has selectively bred out the 'explorer gene' and replaced it with the 'adventurer gene'." "The explorer is a person that has a goal and reads voraciously all the available information concerning the proposed activity. The explorer practices any skills required to perfection. The explorer understands that there are risks, evaluates these risks and takes the necessary steps to minimise risk. But inevitably, the explorer must accept the risks, that there is danger and personal injury or death is a possibility." "The adventurer is the neophyte. They are not really interested in learning all the nitty gritty details, they want to hire someone to take them white water rafting and ensure their safety. At the end of the run, they want a picture and a T-shirt that says, 'I rafted the Monster Killer run.' The reality is, the 18 year old summer high school kid maneuvered the raft, the clients just got wet." I was reminded of the words of Bill Pogue earlier in the year when hearing about the around the world solo sailing exploits of Jessica Watson. I wondered if she'd ever read "Sailing Alone Around the World" by Joshua Slocum, or any of the books by Sir Francis Chichester. Was she just doing it by the numbers? Sheck Exley certainly wasn't. Cave diving is arguably the world's most dangerous sport. Certainly it seemed to be during the time Sheck was pushing the boundaries. If you participate on the highest level, you know that some of your best friends are going to die and in this book Sheck relates how many of his did. If you continue to push yourself and your equipment to the limits if you persist in being a world class diver as Sheck was the chances are very high that you, too, will die. 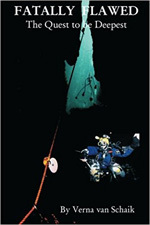 In this book, Sheck tells of his nearly fatal beginnings as a cave diver, of his instant obsession with the sport, of his evolution into a master teacher of safety and cave diving techniques, and of the many dives on which he set length and depth records. Sheck literally 'wrote the book' (several books, actually) on safe cave diving practices. He was the first in the world to log over 1,000 cave dives. In over 29 years of cave diving, he made over 4,000. From this book you truly get an appreciation on the history and development of cave diving techniques and how equipment evolved based off the experiences of the diving pioneers of the 1960's to 1990's. Also the sheer planning and preparations it took to accomplish some of the more aggressive explorations that were done by Sheck and others. Diving Depth Record on Air: 142 metres (465 feet), 11 December 1971, Andros Island, Bahamas. Sheck was actually a safety diver on this dive, not planning to go below 90 metres (300 feet) even though he'd been down to 122 metres (400 feet) during the practise dives. But when two of the three divers attempting to set the record failed to return, he descend further to look for them. He made it to within 15-20 feet of them before being forced to turn back. Those two divers died and their bodies were never recovered. World Record for Underwater Cave Depth: 264 metres (867 feet) on mixed gas, 28 March 1989, Mante, Mexico. World Record for Underwater Cave Penetration: 3,334 metres (10,939 feet), 16 December 1990, Cathedral Canyon, Florida USA. On the 22 April 1987, Sheck set out to establish a new American depth record at Mante in Mexico. He made it down to 157 metres (515 feet) but at 88 metres (290 feet) on his ascent he paused to check the time and discovered his dive watch was gone. Ahead of him were 26 decompression stops, each of which varied in length and had to be precise in order to avoid the bends. Sheck had taught CPR for years and the 60-beats-per-minute pace of chest compressions was firmly imbedded in his mind. He proceeded to count off each 60 beats making a tally mark on his slate to keep track of the minutes. During his 15-minute stop at 24 metres (80 feet) ever try counting off 9,000 seconds a support diver came down to check on him and Sheck was able to use that diver's watch from then on. Some human beings live and die by convictions so strong that most people cannot even comprehend them. Sheck Exley was one of those who lived and enjoyed life at the knife-edge limit. Born on April Fool's day, 1949, Sheck was also a mathematics teacher. He died six days after his 45th birthday, on a dive in Zacaton, a water-filled pit in Mexico estimated to be 335 metres (1,100 feet) deep. Sheck was going for "a nice round number," 1,000 feet (305 metres). His depth gauge read 906 feet (276 metres). This book may terrify you, but it will unquestionably fascinate you, and in the end, Sheck Exley will convince you that his death came to him in the midst of the incredibly intense joy he took in diving into the depths of the earth. Today we have poseurs driving four-wheel-drives that never leave the pavement and lawyers who put on leather jackets and parade around on $20,000 Harleys to show they are free spirits. It seems that everything is style over substance. This book can take you back to the days when there were still a few explorers out there who quietly let their actions speak for them, at least to the few people who are there to listen. As Sheck Exley wrote in the book, "Every field of human endeavour from Tidily Winks to space exploration has its champions and its marks for human endurance and achievement. Without them there would be little or no human progress for we would have nothing to measure our efforts by or encourage us to try harder. It is difficult to imagine any aspect of our lives that is not enhanced by competition, the drive to excel and the recognition of excellence." As Molly Meldrum would say, "Do yourself a favour" and read this book. It will provide you with a fascinating look at a true explorer and pioneer of modern cave diving.